Tim Tebows name has come up numerous times, and all I have heard is "He'll be a situational player", "He'll be an H-Back or Tight End", "He's not a NFL quarterback, a third round pick at best...." and so on. Bottom line in football.... who are the winners who come together as a 'team' and how will they help you win games. Tim Tebow in this instance is a first round draft pick in my opinion, an easy top 5 overall pick. If I was starting the "Hawaii Sharks" in 2009-2010 and had the first pick this year... it would be Tim Tebow. Another guy I would draft.... Pat White from West Virginia. Again... a winner!!! 4-0 in bowl games (2 BCS games) meaning he's a big game player that raises peoples talents around him. Offenses in the NFL are moving to hybrid styles, I'm not claiming the spread offense seen in college will be dominating the NFL anytime soon, but a variation or complemental (is that a word?) portion of it will continue to grow. Wait till you see how many NFL offensive and defensive NFL coaches (especially the ones who've been in the league for over 5 years) flock to college campuses to talk spread offense shop. I found the Miami Dolphins so interesting this year... not just for the 'Wild Cat' and Ronnie Brown, but also take a look at their coaching staff. We know David Lee from Arkansas, but what about George DeLeone and Paul Pasqualoni (together at Syracuse during all those years they played Rich Rodriguez at West Virginia). They've been in the spread offense and defending it for almost 10 years.... I'm sure the offensive staff would keep the door open for Coach Pasqualoni to give some feedback, even though he was the DC. George DeLeone, I've been at many high school clinic's he has spoke at and he's a spread u'm out junkie... learning a lot from trying to defend Coach Rod at WVU in the Big East. Back to my point... this will ALL keep evolving in the NFL, college coaches with spread in their blood being hired as Bill Parcells and Tony Sparano have. It's a natural process. Back to my point point: Tim Tebow and Pat White. Winners, winners, winners, period. And GM's and Coaches in the NFL get fired if they lose, that's a fact no one can deny. Disclaimer: We're not sure Tebow is going pro this year (he's only a junior and has one more year of college eligibility), but Pat White is a senior and will enter the NFL draft. Congratulations to the Florida Gators ! If you watched the game last night, you saw a great play that Urban Meyer has used for some time now even before coming to Florida, but last night might have been the first time some of you may have seen it. 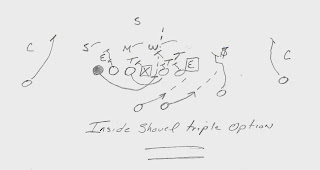 It's off speed option action to the perimeter... but the backside TE (or H-Back in a different formation) runs the inside shovel pass, with his backside guard pulling or folding up into the hole for a gut or kick-out block. If the defensive end knifes down for the shovel pass, the quarterback keeps the ball and attacks the outside with his pitch relationship to the running back. If the defensive end square shoulders the QB or keeps outside leverage, the shovel pass is executed to the TE.